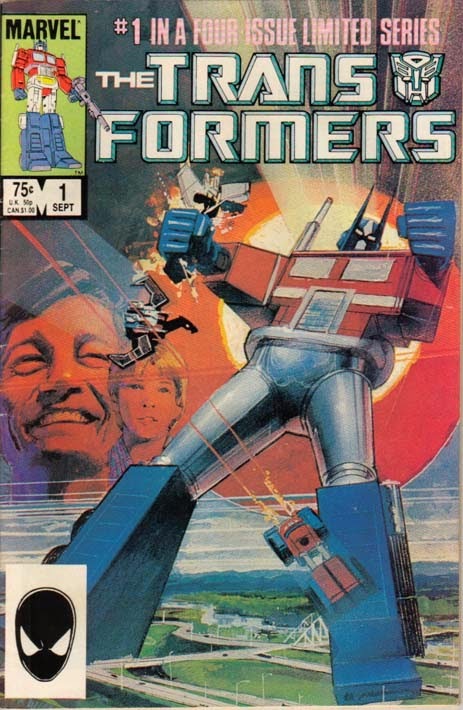 Thirty years ago this month the first issue of Marvel's run of the Transformers hit the racks. I had no clue that there even was a Transformers comic until after issue four or five came out. I don't remember seeing any ads for it and I was still very much in a Star Wars state of mind back then until I saw the Transformers cartoon for the first time. I had a very hard time liking this series of Transformers comic books. It was hard to find; where I was growing up, there were only two places to buy comics and there just were not enough copies to go around. At best I was getting every other issue and sometimes I wouldn't be be able to find a new issue for two to three months. When I was able to get my hands on a new issue, the Autobots were always on the losing side. I know the good guys can't win all of the time but it was ridiculous just how often the Decepticons had the upper hand, it wasn't fun to read. I also was not a fan of the art. I had seen some robot and mech art out of Japan and this shouldn't even be compared to that. I always felt that could and should have been better. I know that I'm spouting a great deal of negativity here, but I did appreciate the fact there was Transformers comic. It came down to being a bigger fan of the cartoon over the comic, and I may have let my expectations to get too big. How I Geek Episode 11 - Alien Adultery?! How I Geek Episode 9 - Drats! Spoiled Again!